You can almost hear the silence. The milkmaid is quiet, so quiet, and time is suspended as she pours milk. The hands work while the mind thinks. 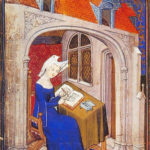 Is it a life of drudgery, or is it a gift–her trivial chore a window into eternity, time to think, to pray, to look out of the window into God? Vermeer’s women lose themselves in: housework. It glows! Is this domesticity? Can it be? That’s the way I want to live my life, slowly, tranquilly, not fighting the irrelevant relevant, the distracting, trivial and necessary tasks of my days, but embracing them as an oasis of contemplation in which desert flowers may bloom.I gaze at Vermeer’s women. I trust things that help me lose track of time–reading, writing, gardening, hiking, the sea, art galleries, prayer, good movies, good conversation. 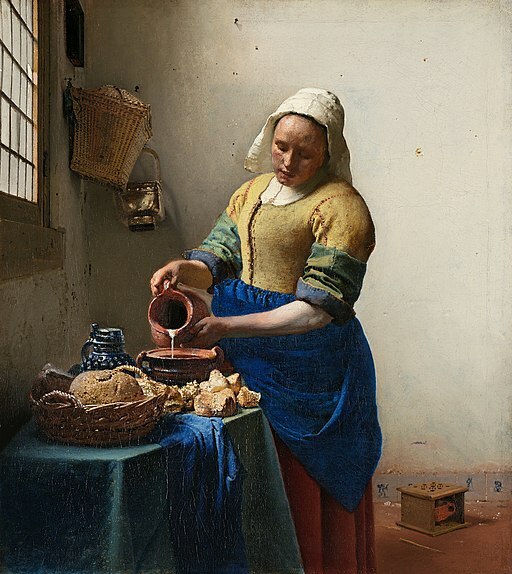 Vermeer’s paintings, poems one might say, on the radiance of domesticity are more moving when we learn of the hurly-burly of his household–a wife, eleven children, and a feisty mother-in-law. Those paintings that could have been called “Shanti, shanti, shanti” or “Tranquility” are probably sighs of yearning, images of an elusive Eden. They hint how manual work–if used as time for contemplation–might be redeemed. I now view the trivial necessary tasks of life which I used to bitterly resent—as (in small doses) gifts: time to pray, time to seek direction, time to worship, time to sense God’s love. I am reading Pete Greig’s Red Moon Rising about the birth of 24/7 prayer movement in Britain. “Pray constantly,” the exhortation of the apostle Paul has challenged and puzzled us through the centuries. As my life grows busier, I relish these accidental windows into prayer: rooms to be tidied, gardens to be weeded, laundry to be sorted, little windy passages into contemplation, to situating myself again in the love of God, and finding peace. Catching up on your posts, so the comment I made on your recent one with Henri Nouen, may go with this as well. My dish washing time growing up, looking out the window at our yard I felt for sure was the precursor to Heaven comes to mind as I read this post. Oh, I resented, yet now love the hours I spent cleaning that house as my thoughts roamed and often landing on God. When I had a cleaner, a ‘complete Jew,’ I played praise music and she loved it. Now, I’m older and appreciate quiet. I still play worship music when I clean, though often enjoy turning it off, and thinking or praying or letting my thoughts wander! Thanks Anita, as someone who hates housework and tends to rush at it in irritation and haste to get the necessary over with, I really enjoyed the post, and the pictures are wonderful, so calming. I will try and use these thoughts to change my methods in future! Oh, I have resented it housework for most of my life, and have only, in recent years, used it as time to think, plan and pray! The hands work while the mind thinks! “They hint how manual work–if used as time for contemplation–might be redeemed” – oh, yes, – how the daily work becomes a praise gift to Him. I’m learning to find the love letters in the daily – in things like the blue of the apron in the painting above -or the task of my hands. I so enjoyed the art – and the message! Thank you. I stopped over at your beautiful blog too. You are raising those boys so well! Anita, this reminds me so much of Brother Lawrence! Talk about practicing the presence of God. I don’t know whether I mentioned it, but the Church Council met last Friday. They’ve asked me to be part-time pastor for their little congregation. And, I decided that my sermon series for the summer will concentrate on . . . wait for it . . . prayer! Congratulations, Elizabeth. I am sure you will be a wonderful pastor. What a wonderful outlet for your training, passion and experience. And I just prayed that your series on prayer will inspire your congregation. I would have chosen that too–that or on Jesus! Way to go, Anita! Housework a wonderful blessing – think of the exercise one gets, as well as the chances, as you say, for contemplation, plus service to others, etc, without even having to put special time away. Multitasking, of a sort! Th e Vermeer is beautiful, isn’t it? Gardening, however, I love, and I spend an hour a day doing it.